"What a beautifully written obituary. My thoughts are with..."
"My condolences to her family. I have fond memories of..."
Nancy Palmer, 80, was called to heaven in the comfort of her Vancouver, WA home on April 8, 2019. She was born on May 5, 1938 in Vancouver to Forrest and Frieda Crawford. Nancy married Jim Palmer and lived a full life together for 62 years until Jim’s death in 2016. Their love was captivating and present daily for everyone to see. Devout in their faith in God, they gave a leading example of true love to those surrounding them. In addition to providing a loving home, she also worked at different jobs and at one point owned Mode O’ Day dress shop in downtown Vancouver. There she thrived through helping her customers and making lifelong friends. Nancy was a beautiful, loving wife and mother. She was the center of family life. She planned and celebrated every holiday, family birthdays, and special anniversaries with a party usually at her home. She showed her love through her skills in the kitchen as she prepared amazing hot meals for every event. Even out camping, she could pull off a great dinner and a cake. Over the years, Nancy was heavily involved and a committed mother to her four children. Attending sporting events, schooling, and being there for their friends. She was full of laughter and happiness and blessed her children in many ways including spending time working in the Little League stands, supporting her children’s careers, and even providing delicious treats to her daughter’s coworkers. Nancy’s welcoming and thoughtful character allowed for many friends of her children to be drawn to her for guidance or simply to visit. Later in life, Nancy and Jim were blessed with three generations of grandkids. They represent the true definition of passionate grandparents, loving every moment of each adventure. They gave them the gift of time while attending school or sporting events, graduations, and weddings. Never hesitating to travel near or far, to be present for them during major milestones in their lives. Nancy enjoyed visiting the beach and camping. 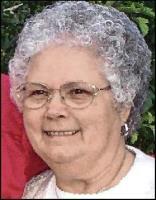 She was an avid reader, a master at jigsaw puzzles, and games with friends and family. Later in life you could find her doing word searches while watching old western shows. Nancy will be deeply missed by her family and friends. Nancy was preceded in death by her husband, James Palmer; brother, Fred Crawford; and grandson, Paul Christopher Palmer. She is survived by her sister, Barbara Weir; four children, Kathy Thompson (Stan, deceased), Terry Ledoux (Jim), Vicki Warren (Jim) and Jim Palmer Jr. (Carolyn); 6 grandchildren; 16 great-grandchildren; and 2 great-great grandchildren. Services will be held at Evergreen Memorial Gardens in Vancouver on Thursday, April 18, 2019 at 12:30 p.m. with a 2:30 p.m. graveside service. There will be viewing Tuesday 10:00 a.m. - 8:30 p.m. and Wednesday 10:00 a.m. - 6:00 p.m.